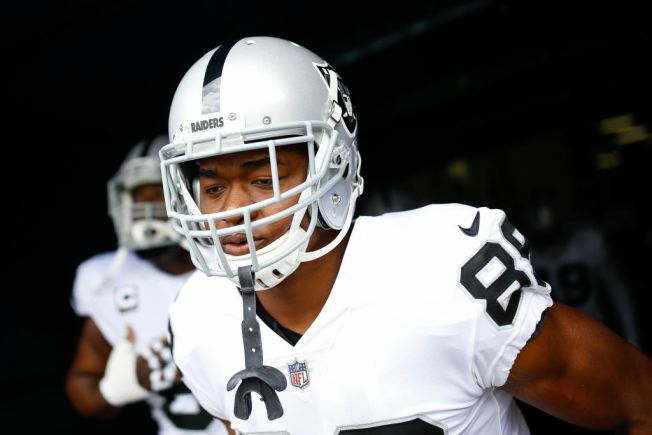 When Jon Gruden was named head coach of the Raiders, one thing he said was that wide receiver Amari Cooper would be a centerpiece of the offense. To Gruden, Cooper was just too good to not use as much as possible. But in the Raiders’ first game under Gruden, a loss to the Rams Monday night, Cooper was targeted just three times and caught only one pass for nine yards. After watching film of Monday night’s 33-13 loss, Gruden says the Raiders should have thrown Cooper’s way much more often. One analyst broke down the film and noted Cooper not only beat Pro Bowl corner Aqib Talib on a few occasions, but was timed as one of the fastest receivers in the NFL while running his routes. Steven Ruiz of the NFL website For The Win noted that many of Cooper’s routes were deep ones that were used to clear out space underneath for other receivers to get open. Ruiz noted, too, that even when Cooper would break free deep, Carr occasionally forced a shorter throw instead. Carr did have a lot of success, however, going to tight end Jared Cook, who had a huge night with nine catches for 181 yards. The question is, will the Raiders be able to get the ball to Cooper more often this Sunday, when they travel to Denver to take on the Broncos. Kickoff is set for 1:25 p.m.